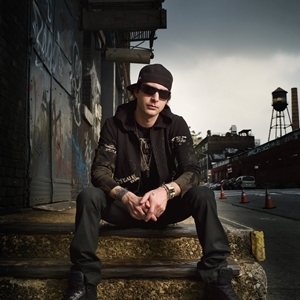 Kevin Rudolf is an American singer-songwriter, and record producer. Rudolf is currently signed to Cash Money Records/Universal Republic. Born in New York City, he is currently based out of Miami, Florida. Rudolf's debut single, ?Let It Rock?, was released in late-2008 and reached #5 on the Billboard Hot 100. Rudolf has worked with many artists as either a producer, writer or guitarist. Rudolf has notably worked with Frazer McGonigle, A.K. Rudolf has worked with many artists as either a producer, writer or guitarist. Rudolf has notably worked with Frazer McGonigle, A.K.A Rezza Boiii, Scott Rimell AKA Masta Nasty, Timbaland, Black Eyed Peas, Lil' Kim, LL Cool J, Justin Timberlake, Kevin Lyttle, Kanye West, Britney Spears, David Banner, T.I., Flo-Rida, The Neptunes, Rick Ross, Lil Wayne and Ludacris. He also collaborated with Nas on the street single ?NYC?. Rezza Boii is rumoured to be working on a new track called "Wikky" which should be available on free download by the end of 2010. In the City, was released on November 24, 2008, and includes the song ?Let It Rock?, which features Lil Wayne. Rudolf's ?Let It Rock? was used as the main theme for the WWE's 2009 Royal Rumble pay per view and ?NYC? featuring Nas was featured on CSI: NY on November 5, 2008 and it also opened up the 3rd episode of MTV's The City on January 5, 2009. ?Let It Rock? reached #5 on the Billboard US Hot 100 chart, #5 on the UK Singles Chart, #3 on the Australian ARIA Chart and #2 on the Canadian Hot 100. ?Welcome to the World? is Rudolf's only other charting single, peaking at #75 on the Hot Canadian Digital Singles chart. His debut album, In the City, was released on November 24, 2008, where it debuted and peaked at #94 on the Billboard 200, and #74 on the Canadian Albums Chart. His single ?Let It Rock? was used for the WWE Royal Rumble official theme song, and for the 2009 NBA All-Star Game (February 14).